Mirak 2 at the Raketenflugplatz (rocket airfield) near Berlin. Liquid oxygen is in the large tank at left; the fuel is in the long thin tank at right. Mirak (Minimum Rakete) was a series of small rockets built and launched by members of the Verein für Raumschiffahrt in 1930–31. Mirak (a contraction of "Minimum Rakete") had a body about a foot long and a tail section about 3 feet long. The tail held the tank for the gasoline that the fueled the rocket, while the oxidizer (liquid oxygen, or LOX) was stored in the head. The tiny copper motor resembled the Kegeldüse built by Hermann Oberth, but it was immersed in the liquid oxygen, which was expected to furnish more than enough cooling. Mirak 1 had a successful, if brief, stationary test in August 1930 in Bernstadt, Saxony. But during the next test, held in September, the oxygen tank burst and the rocket was destroyed. Mirak 2 was built and tested with a substantially modified cooling system. 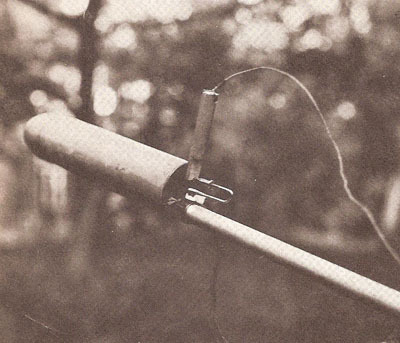 By the spring of 1931, Mirak 2 was regularly developing thrusts of around 70 pounds in 10-second tests. Finally, it too exploded. The theory was sound, but the technology was just too primitive. Most of the difficulties with these and earlier liquid propellant rockets stemmed from cooling, or rather the lack of it. The combustion chambers usually burned through after a short firing period. Their materials were unable to withstand the heat of the burning gases, and the heat transfer to the coolant was inadequate. Clearly the experimenters had to develop better means of cooling their rockets before they could proceed to flight testing. A motor was finally built that had aluminum walls cooled by water, rather than the liquid oxygen of the earlier Miraks. The motor was incorporated not in Mirak 3 but in a new rocket that Willy Ley nicknamed "Repulsor."